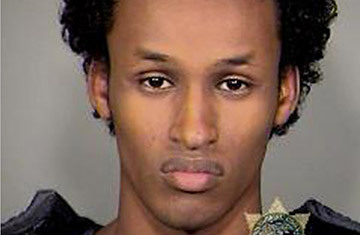 Portland's Bomb Plot: Who Is Mohamed Mohamud? Mohamed Osman Mohamud, 19, a Somali-born U.S. citizen, is too young to drink but apparently old enough to pursue jihad  the version preached by al-Qaeda. On Friday night he was taken into custody after authorities alleged that he had tried to ignite a phony bomb on a street in Portland, Ore., near a packed public Christmas-tree-lighting ceremony. What he had actually done was detonate his own arrest in an FBI sting. The FBI's detailed affidavit portrays Mohamud as hell-bent on bombing the popular annual event in Portland's Pioneer Courthouse Square. The FBI complaint details how undercover agents proposed other, less lethal ways Mohamud could help the jihadi cause besides bombing, but the young man was steadfast. Indeed, the affidavit contains virulent quotes allegedly from Mohamud: "I want whoever is attending that event to leave, to leave either dead or injured"; "You know what I like to see? Is when I see the enemy of Allah then, you know, their bodies are torn everywhere"; "It's gonna be a fireworks show ... a spectacular show ... New York Times will give it two thumbs up"; and "Do you remember when 9/11 happened when those people were jumping from skyscrapers ... I thought that was awesome." It seemed to be another case of a young American radicalized by Islamist extremism. But Mohamud seems to have been almost as angry at his family. The FBI affidavit never explains what prompted the bureau to put Mohamud on the no-fly list, which prevented him from traveling to Alaska last June and got him an FBI interrogation instead, in which he admitted that he had originally been planning to go to Yemen where he knew someone. It does say, however, that Mohamud later e-mailed the undercover FBI operative to say, "I was betrayed by my family; I was supposed to travel last year, but Allah had decreed that I stay here longer." And according to the FBI report, in a goodbye video Mohamud recorded on Nov. 4 after a practice detonation, he had a specific message: "To my parents, who held me back from jihad in the cause of Allah, I say to them, If you make allies with the enemy, then Allah's power will ask you about that on the day of judgment." Mohamud's mother and father and his two sisters have remained silent since his arrest. (The Oregonian identified the parents as Mariam and Osman Barre; they reportedly split up a few years ago.) However, a prominent member of the Somali community in Portland (estimated to number 8,000) says a relative played some role in helping to put the FBI on the young man's trail  though that relative was almost certainly unaware of the scale it would assume. "Before this happened, the father informed Homeland Security and the FBI that something was going on with his son," claims Isgow Mohamed, executive director of the Northwest Somali Community Organization, who says he knows Mohamud's family well and had been in touch with them. "This a good family. The father is an engineer at Intel. This is not somebody who is on public assistance. He is a family man, a businessman, a religious man, a soccer player." The FBI document indicates that federal agents asked for and received court authorization to begin surveillance of Mohamud and to track back his e-mail. It is not yet clear what prompted the FBI to make the request  though family concerns that Mohamud was going to fly off to join terrorists might conceivably have set off the initial alarms. Indeed, relatives may have been concerned for a couple of years. Mohamud once attempted to get a visa to travel to Pakistan during a family visit to Britain but failed because his passport was not valid. The affidavit says that Mohamud started thinking about jihad and becoming a mujahid at the age of 15, during the Muslim holy month of Ramadan, when he heard someone talking about martyrs. He allegedly said he "didn't even have to hear anything else ... This is a decision that I made ... and if you don't sacrifice your own kids, when will victory come, you know ..."
According to the Associated Press, "agents began investigating Mohamud after receiving a tip from someone who was concerned about the teenager." Responding to a query from TIME, the Department of Justice would not confirm or deny whether Mohamud's father helped put him on the FBI's radar, saying only that "the FBI pursued multiple investigative techniques in this case, and the affidavit references certain communications that took place as early as August 2009. There is no factual allegation in the statement of probable cause regarding any tip from the community, and therefore it would be inappropriate to make any public comment." If Mohamud's father did play a role in the case, it would be achingly familiar to the part played by the wealthy father of Umar Farouk Abdulmutallab, the young Nigerian who tried to blow up a plane over Detroit last year and who is now popularly known as the underwear bomber. Abdulmutallab's father, a banker, allegedly went to the U.S. embassy in London to warn them of his son when he became alarmed at the young man's dalliance with jihadi ideology. After receiving court permission, the feds found Mohamud's August 2009 e-mail contact with an unnamed "unindicted associate," who turned out to be in a volatile northwestern region of Pakistan. By December, Mohamud was allegedly discussing joining the man, as the affidavit says, "to prepare for violent jihad." (When he was stopped from flying to Alaska in June 2010, the FBI asked Mohamud if he knew anyone in Yemen and the young man named the unindicted associate he was in e-mail contact with.) Mohamud then made an attempt to contact a second unindicted associate to plan his trip but messed up the e-mail address by confusing it with a password. The FBI would later use this confusion to set up a similar e-mail to lure Mohamud into the sting. When he finally focused on Portland as a target, Mohamud allegedly told the FBI that he wasn't worried about U.S. security getting in his way because law enforcement does not "see it as a place where anything will happen. People say, you know, why anybody wants to do something in Portland, you know. It's on the west coast, it's in Oregon; and Oregon's like, you know, nobody ever thinks about it." Asked what would happen if the plan went badly, Mohamud said he wasn't worried "because if you were going to [paradise] you wouldn't have to worry, right?" But he would eventually choose to detonate the car bomb by a remote cell-phone call because, according to the affidavit, "martyrdom required the 'highest level of faith.' He was concerned that after living in the United States and attending college, he may not have that 'high faith.' "
On Nov. 26, after a final inspection of what he believed would be an "amazing" bomb, Mohamud was asked once again by the undercover agent if he wanted to go through with it. He allegedly said yes and reportedly smiled when he heard a TV report that 25,000 people were expected in Pioneer Courthouse Square that evening. When the time came, Mohamud repeatedly dialed the designated trigger number, but no explosion occurred. Federal agents arrived shortly afterward to take away a kicking Mohamud, who shouted "Allahu akbar"  Arabic for "God is great." The affidavit says there is probable cause to charge him with attempted use of a weapon of mass destruction.